Santa Tracker Unaffected By Government Shutdown, NORAD Says Despite gridlock in Washington, D.C., more than 1,500 military personnel and volunteers at a Colorado Air Force base will be hard at work Christmas Eve, tracking Santa and answering children's calls. 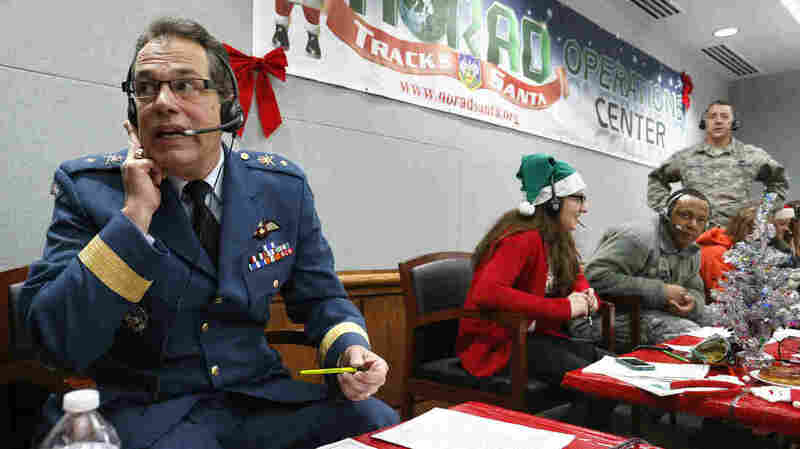 Every year, NORAD staff and volunteers field calls from children inquiring about Santa. Canadian Brig. Gen Guy Hamel joined in the tradition in 2014. Amid the partial government shutdown, at least one critical service remains operational: NORAD's Santa tracker. More than 1,500 military personnel and volunteers at an Air Force base in Colorado will be hard at work Christmas Eve, tracking Santa Claus and answering children's calls. Every year, in a tradition that dates back to the Cold War, volunteers field tens of thousands of calls and emails from around the world, according to the North American Aerospace Defense Command. Children ask for Santa's location, discuss their Christmas lists and probe volunteers for other details. There's even a handbook for handling different kinds of requests, Politico reports. Those volunteers, who take two-hour shifts starting in the early morning on Dec. 24, wouldn't be there if not for a typo in a local newspaper in 1955. When Col. Harry Shoup picked up his secret hotline at Peterson Air Force Base in Colorado, he was expecting a call from a four-star general at the Pentagon, according to a 2014 StoryCorps interview with his children. "And then there was a small voice that just asked, 'Is this Santa Claus?' " his daughter, Pam Farrell says. His family says that Shoup was annoyed. The United States was nearly a decade into the Cold War, and the colonel was prepared for reports of a nuclear attack, not requests for Santa Claus. But when the child started to cry, he responded jovially. Then he asked for the boy's mother. The mother explained that a Sears ad in the newspaper instructed kids to call Santa "any time day or night." But the newspaper had accidentally printed the number for Shoup's private red phone, instead of the store's. So as the calls came in, Shoup put his airmen on the phones to pretend to be Santa Claus. The tradition has continued for more than six decades, outliving its creator — Shoup died in 2009 — and maybe even its accidental architect. Sears filed for bankruptcy in October. And the "tracking" technology has evolved over time. Maj. Todd Walter, a mission crew commander with the Canadian Air Defence, offers some specs in a video. "We use radar systems scattered across the world, along with satellites providing infrared imagery, and then we have Santa Cams scattered throughout the world," Walter says. "And then jet fighters that also go out and intercept Santa." NORAD has received criticism in previous years for tying military products to Santa's journey in kids' imaginations. In 2013, the Campaign for a Commercial-Free Childhood spoke out against a promotional video showing those animated fighter jets, saying the video inserted "violence and militarism" into a beloved tradition. The quirky holiday tradition also doubles as a marketing tool. Corporate licensees foot the bill, as NPR's Mark Memmott reported in 2014. This year, HP advertised its support for the program, and The Hill reports Microsoft and General Motors have gotten involved with the effort. None of that dampens the cheer of children who pick up the phone. "They're all really sweet, small voices," Madison Hill, a volunteer who helped answer the phones, told The Associated Press. "I had a little girl tell me good night instead of goodbye. It's really sweet." The bad news? Unlike when Shoup picked up his phone in 1955, these days you can't talk directly to Santa. "Santa and his reindeer must go, go, go," booms an animated Santa in a series of NORAD FAQ videos. "We can't stop to chat, although it would be fun." He does answer a few questions on the website, though, like, "What's Santa's favorite cookie?" and "Do kids need to eat their dinner?" Asked by a kid whether he could have a real firetruck, not a toy one, Santa deflects. "I'm sure one day you'll grow big and strong and maybe become a firefighter to help others." To get the latest information on Santa's movements this Christmas Eve, call 1-877-HI-NORAD (1-877-446-6723) or email noradtrackssanta@outlook.com.